When it comes to the point to troubleshoot Exchange Web Services related issues, where do you start? When it’s related to F/B requests of Outlook there used to be some client-side logs available. Since Office 2013 not anymore, as these data are all moved into ETL files, which are encrypted. It can be also hard to troubleshoot a Mac client or even cross-org or Hybrid scenarios. So how can you start troubleshooting? 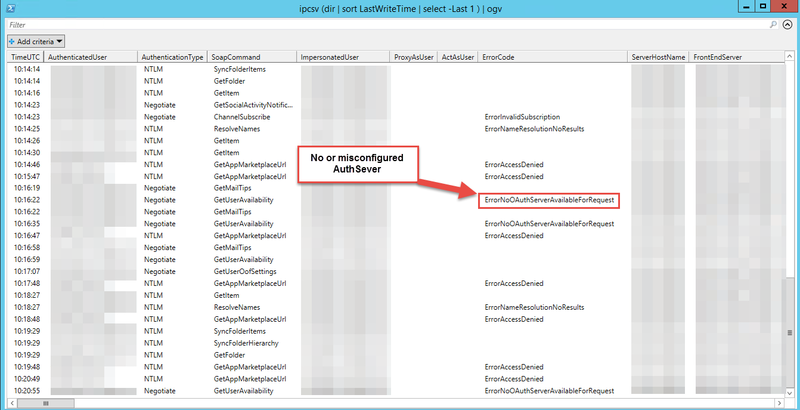 Starting with Exchange 2010 you will find EWS related logs on the servers and you can easily parse them. The newer the Exchange version is the more information is logged. 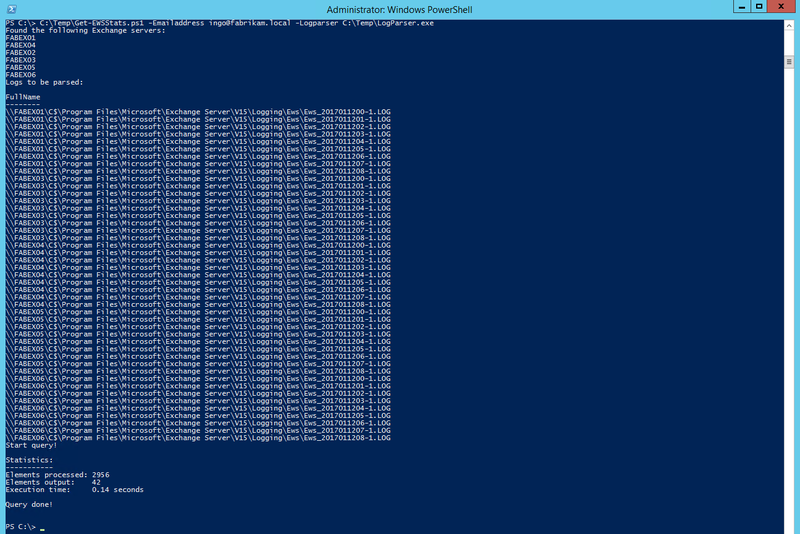 If you have only a few servers, you can use your favorite editor or parse the logs using PowerShell. I love LogParser and as I have multiple servers, I wrote a script for this task. The script will search for Exchange server within given AD sites, determines the installation path and search then in those paths for log files. There are several possibilities you can filter for (e.g. : servers, AD sites, dates, users). Emailaddress Normally the users are logged with their PrimarySmtpAddress. But the SamAccountName is also used. Exchange2013 This switch controlls, which version of Exchange should be searched. By default it’s set to $true, which means the script search for Exchange 2013 and newer versions. OneFile By default the script generates for each day a seperate file. If this switch is used, the output will be only one file. Note: As mentioned in the description of the parameters Emailaddress, the applications can use multiple names for a user. This also depends on the authentication. I recommend to use PrimarySmtpAddress of the user. If you don’t get the expected result, use Emailaddresses and PrimarySmtpAddress and SamAccountName for the user you are troubleshooting. As you can see there are now less logs to be parsed, which improves performance! Note: You will find entries for users ONLY on those server, where the database was currently mounted. That means you can improve the script’s performance, when you filter by hour and only to those server where the user’s mailbox or the mailbox the user accessed was mounted. To get this fixed read carefully Configure OAuth authentication between Exchange and Exchange Online organizations or even better run the Hybrid Configuration Wizard. In the following example the servers were behind a proxy, but InternetWebProxy was not configured properly. The second error is expected as I tried to lookup availability for an unknown user. As you can see there are a lot of information available. You just have to know where to look at and how to parse. I hope this helps. This entry was posted in Analysis, Clients, Exchange, Powershell and tagged EWS, F/B, Logs, Performance, Troubleshooting by Ingo Gegenwarth. Bookmark the permalink. I reckon I am doing something wrong, but am not really sure what. I would appreciate any suggestion on this. could you please run the script and use the parameter “-Exchange2013:$false”. This is a switch, but I set it to $true and therefore you need to set it explicitly to $false. I’m currently spinning up an Exchange 2010 in my lab as I don’t have anymore Exchange 2010 in production. Hi, Thanks for that, i amended the script with that, but found the error was else where (UI) so no need to spin up ex 2010 labs, once i sorted that it is now running, but doesn’t give any output as no logs are available for some reason for that user, I assume I should be using the On Prem account for the email address?. thanks for the fast response(while it took long on my site). You need to use the UPN or SamAccountName of the person, who authenticates and sends the request. With Exchange 2010 you need to parse the logs across ALL CAS roles, while starting with 2013 you only need to where the target or the authenticated mailbox can be active.